We first met Vicky when she was donated to the public, county-owned lesson program in Northern New Jersey where both my daughter and I ride and work (barn staff and instructor, respectively). I’ve been riding and teaching there for more than 22 years, and Tory has been riding there since she first became old enough for the program at age nine (17 now!). The program where we work and ride serves all area residents from beginners up through 2’6″ jumpers and everything in between, as well as offering trail riding, pony parties and many other special events throughout the year. When she was donated, we were told that she was an orphan foal, and that she had a strong, alpha-mare personality, was inclined to stay with her food until it was eaten, and had a strong, smart mind, too! After she got used to her new surroundings, Vicky quickly developed a devoted following among the advanced flat riders and then the jumping riders, too; she has never been seen to spook, nor buck, and she loved to go forward! Her gaits were proud and smooth and lovely–fully representative of her name. Sadly, an injury in the field when she was led past another alpha mare guarding the gate resulted in a hind-leg injury that put Vicky out of commission for a long time. Eventually, she ended up being “retired.” About 10 years ago, the Friends of Lord Stirling Stable volunteers at our barn began a School Horse Retirement Program to help pay board and medical care expenses for horses who were no longer able to work in the lesson program. So far I believe more than 40 horses have found happy, loving forever homes! 🙂 It is a purely volunteer effort and the result of many loving hands and hearts. Of course, the ultimate reward is seeing the happy human and adopted horse in their new journeys together! We adopted Vicky and moved her to a lovely new home where she was incredibly happy. Unfortunately, though, the grass proved too rich for her and she pasture-foundered. She has been on the road to recovery for months now and the vets are encouraged by her progress. She does love her food (is there a smart mare who doesn’t??) but she is a VERY picky eater. From the get-go, she has adored her Beete Bites and it is such a joy for us to be able to reward her in a way that is healthy and trustworthy! Thank you so much for helping us “treat” her right. She is a great joy to us every day, and we are glad to bring some fun into her life, as well! Vicky is now 25, and may or may not ever be rideable again–but that was never our main goal with her. 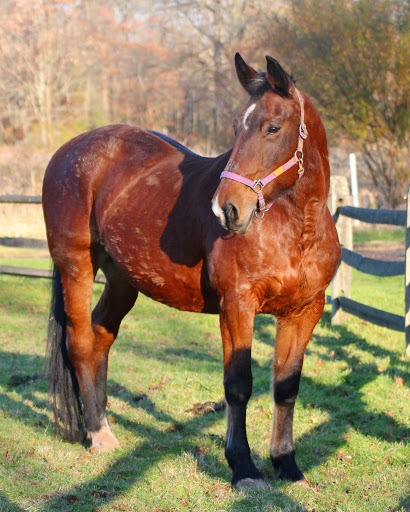 Most of all, we wanted to give her a wonderful, happy retirement with people who understood and respected her needs in a family-oriented, loving, healthy barn. We feel so lucky to know and take care of her! Each day with her is a little adventure in itself, and we treasure every moment and every memory.